The realm was once home to an ancient civilization, which has long since disappeared, leaving behind relics of unknown power. Across the land, factions fight over the mosaics, some seeking to solve their code, others afraid of what might happen if their power is unlocked. Do you have the wits to unravel the mystery? Find out in Mystery Mosaics! Mystery Mosaics is rated 2.9 out of 5 by 17. Rated 5 out of 5 by gg1941 from Mystery Mosaics Best of Mosaics. Hope there will be more coming in future. Rated 5 out of 5 by Poodlebear from Came back looking for more. First time through I only did the standard nonogram puzzles because I didn't understand the other sort but I must have been tired or something because when I returned I saw they worked under the same principle as minesweeper. What a cool and innovative idea! VERY challenging but I loved that if you worked carefully and understood the concept you never had to guess, unlike many of this sort. It was all logic. Sadly I don't see another of this sort. Don't let the low star rating fool you. Great puzzler if you like this kind of game. One notch off for visual because sometimes the colors were too similar or hard to see against background. Rated 5 out of 5 by szeb from I've been waiting for this for a while now... I don't review games often, but I felt I had to review this game since I feel it has gotten an undeserved low rating. I first played Mystery Riddles over a year ago and loved it. It's one of the very few games I replayed and I checked every so often if there was a new one out. And happy holidays a new one did come out! I'll be honest, I only play the Fill-A-Pix ( I think it's called) in which you fill in a picture by coloring in the number of filled in boxes that are supposed to be in a 3x3 grid. So if the number in the center is 9, then all are filled, easy enough. The challenge comes with the lower numbers and the fact that all the 3x3 grids, which do overlap, have to work. It's difficult to explain, so I recommend trying it in the demo. In the end you do get an image, though they are usually not obvious while you are doing the puzzle, and I never quite focus on that since I get too engrossed working with the logic of the grids. 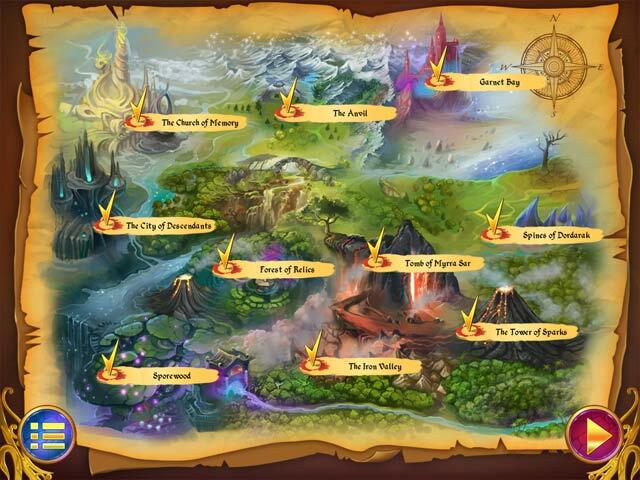 There are 10 levels with 10 puzzles each and they get progressively harder. I really enjoy these puzzles. The other way to play is the standard mosaic, which I have to admit I haven't played. After being challenged by Fill-A-Pix, which I have never come across in any other game, the standard mosaic lost it's magic for me. If that's all you want to play in this game, then you're likely better off looking at a game which specializes only in that (like Mystery Mosaics) as other reviewers have said. However, if you enjoy logic puzzles, want to twist your brain a bit and try something new, I highly recommend this game. Please Big Fish, more of this type of puzzle! Rated 5 out of 5 by laur1234 from Anyone up for the challenge? Two ways to play, so much fun and makes you think. I am a huge fan of fantasy mosaics but this game is not for those who play those games on easy and try not to reach gold for every level. Beautiful and calm music in the background makes it not feel rushed to complete. Is it worth buying? Only if you are up to the challenge and won't give up. Rated 4 out of 5 by mrm2006 from The 'Mystery' is ...................... ............. all the pictures seem related to knights and/or pirates. The storyline was ok, as was the music and sound fx. At least I didn't have to turn anything down - lol. There are no mini-games between levels. There is only 1 mode of difficulty. There are 2 game settings: pic-a-pic or fill-a-pic. Don't know the difference between the two as I played the usual type of 'filler/griddler/mosaic' type of game. There is an automatic tutorial. I could find NO way to turn it off .... which was annoying. You can earn up to 3 mistakes before you have to replay a level. 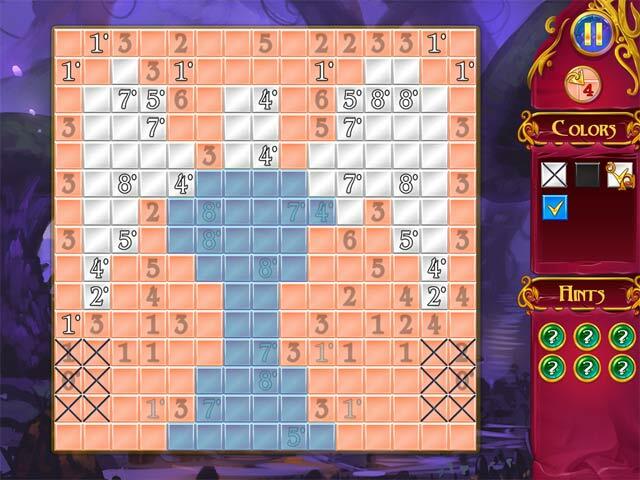 The gist of the game is thus: Your game board consists of a graph of blocks. Along each side are sets of numbers. Using those numbers, you fill in blocks on the graph and, when finished, create a picture. I LOVE this genre of gaming! What I found rather challenging was that (1) there are colors ..... but you don't play color (a), then color (b), then color (c) and so on. No. When you fill in ... say .... 4 blocks at once .... they may be blue, red, green, green .... instead of placing those colors over 3 turns. At the beginning of game play, I was easily ..... confused - lol. However ....... when the demo ended, I literally SCREAMED at the computer ("NOOOOOOO! I want to keep playing!!!! "), That is my personal 'wow' factor. I'm not even waiting for Bonus Punch Monday, I'm off to purchase it ............ NOW! Enjoy! Merry Christmas! Rated 4 out of 5 by arnold1049 from STANDARD FARE I played the demo for this game and it has some shortcomings, but for diehard mosaic fans, they can be overlooked. The most serious problem is the colors used for the grid. The background is a pale pink and the colors for the filled tiles range from light to dark. I had to continually remind myself that pink was a tile that still needed attention. This color confusion led to some mistakes which made the playing a little frustrating. Another factor that was a little irritating was the tutorial. First, I saw no way to avoid it, and second, it was definitely geared to a person who was playing their very first mosaic. The quality of the tutorial was also poor and seemed to be confusing at times. There are 2 modes of play as indicated in the game description. I played the standard, easier (my opinion) fill and cross mode. The grids were very easy to solve at the beginning and did not get too much harder during the demo. But I'm sure, like most mosaic games, the difficulty would have increased further into the game. The game starts with Player 1 already set up, so if you want to play under your own name, you have to go change the existing player. This is not that obvious which I feel is another strike against the game. So how come 4 stars? I really like these kinds of games and this one had good graphics and a somewhat interesting storyline. But play the demo and judge for yourself. Rated 3 out of 5 by Gesneramor from Holy Eyestrain, Batman!! I love these kinds of games. This one is challenging and fun. I don't know about the 'storyline' because I don't really care about them in this type of game. I had two issues: the colors used were often too similar. That made it hard to distinguish whether a square was marked off or not. Also, the squares are much smaller than they need to be -- I'm running this game in fullscreen mode but there's a lot of unused real estate. A 25X25 grid has itty bitty little squares -- pretty frustrating. I only recommend if you know that you like these kinds of puzzles. Try the demo and see. Rated 3 out of 5 by Shumana from As grid puzzles go..it is o.k. 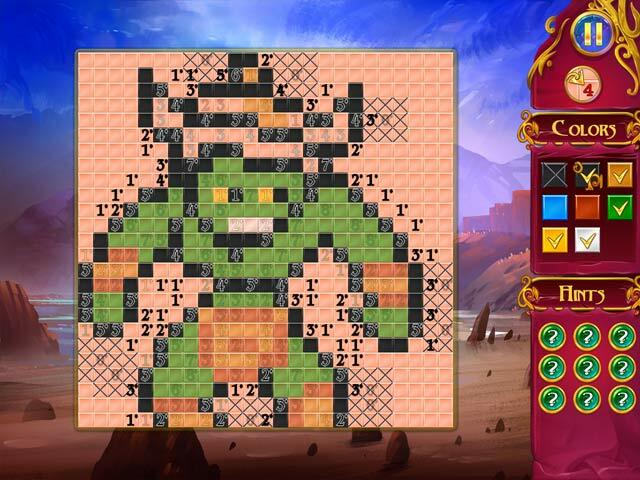 I love grid puzzles, especially the Fantasy Mosaics series, and this one is alright, but compared to others, not great. While there were options to playing, it didn't offer the fun factor of others, and I found myself getting bored halfway through the hour trial. If you like standard grid puzzles, then you will enjoy this game but there is no "wow" factor to playing it. Rated 2 out of 5 by campingramps from Not one of ANAWIKI's best games One of my favorite games is by ANAWIKI which developed this game but there is no comparison. Starts off as if everyone is a child rather than getting right into the game with minimum instruction. I mean, come on, it's just a simple mosaic and not an earth shattering revelation. When I saw who the developer was I couldn't wait to start put I should have because you have to go through the lame tutorial or you can't advance. Plus I hate this type of mosaic where you have to right click to eliminate the unused squares. Just leave them alone. The graphics were not up to par and the music is annoying. I don't even true mosaic lovers will go for this one. A real thumbs down game. Rated 2 out of 5 by gr8rwmn2 from Needs more help to figure out the tutorial Once I got pass one level of the tutorial, I did find it challenging and fun. The picture on my screen is small and with my poor vision, it is hard to work on more than just a few minutes without getting eye strain or a headache. When I went to the other type of game available, the tutorial again stinks. I have been working on 1 level for several days now and am unable to pass it. The frustration level is greater than any fun that I have experienced playing it. Try it for yourself, just be forewarned. 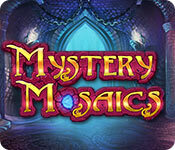 The ancients have disappeared, leaving behind mysterious mosaics, whose secrets only you can unravel!